I’ve never heard of a Cherokee purple! I find the brand loyalty to mayo entertaining. Is it Duke’s or Helmans? I’m not a mayo gal (Miracle Whip all the way) but my husband will not touch Duke’s. Too funny!! Around here, it’s a southern thang! I think the mayo thing is funny, too. After my in-laws moved to NC from central MD, mother-in-law raved about Dukes. It’s available here on MD’s Eastern Shore (but not central MD) and having had both in the fridge I don’t really care either way. 🙂 Go Miracle Whip! Looks like you may cut your bacon strips in half as i do so that they don’t curl up as much and fit better in the pan. I bake my bacon now and find it so much easier. Mayo – give me the real thing without making it – Duke’s or Sauer’s (read the labels, people). Plus, I would have had twice that much mayo on MY sandwich (and probably more bacon, too). 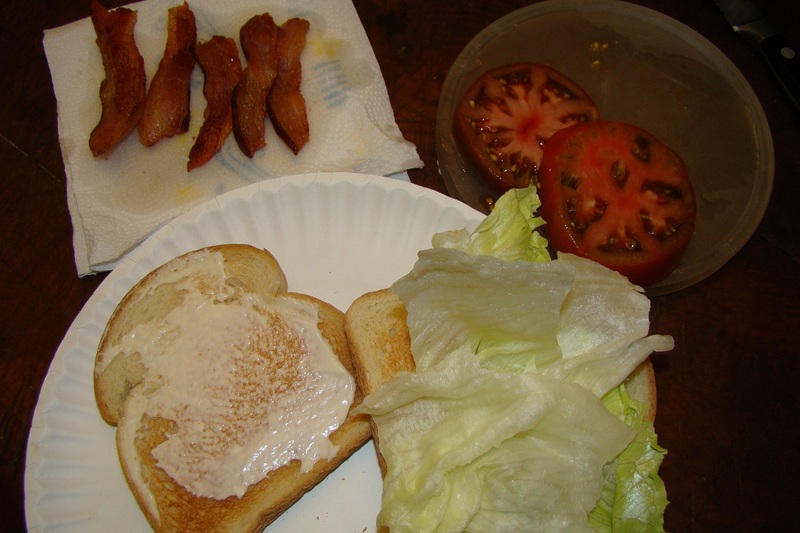 I am such a pig for BLTs! Ha, ha, ha, ha……..